>> So : U’re on the guest list ! That’s impressive. 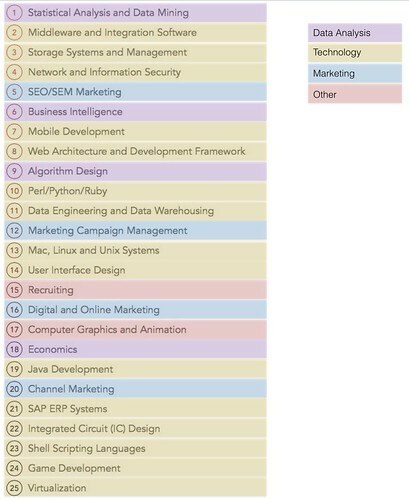 Of the top 25 skills, only two are not in the buckets of marketing, data analysis, and technology – and they’re down at positions 15 and 17. So these are the hot skills of 2014, of the year that was. If you wanted, as Wayne Gretzky would say, to skate where the puck is rather than where it was or where it is now, what would you pick as the top skills of the year ahead? My recommendation is simple: combinations of these skills. Being proficient in one skill set is likely to get you a good job somewhere. Being proficient at two? That makes you nearly indispensable. Suppose you had a background in statistical analysis and data mining, AND a background in network security. You could build and identify security problems just as they broke out and started trending, putting you far ahead of the pack. Suppose you had a background in business intelligence and mobile development. You could engineer the next generation of business intelligence apps, the sort of apps that people would love to use. Suppose you had a background in Perl/Python/Ruby and SEO/SEM. You could code infrastructures or make ridiculously sticky content because your content would be more interactive and more fun than the standard swill. This is where the puck is going or could go, and these combinations of skills are what will differentiate the top performing employees from everyone else, make or break the next wave of startups, and redefine your business. Look for them, test for them, and grow them in your companies! If you’re a marketer looking for the next big thing, the next big thing is you. 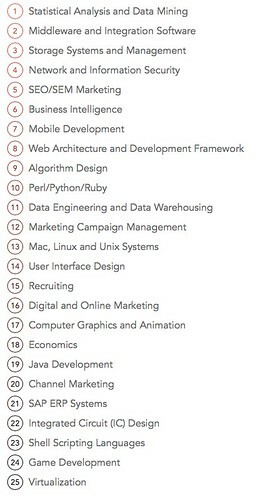 Pick out a skill on this list that you don’t have and grow it alongside the marketing skills you already have. You’ll be virtually unstoppable.